I pre-painted the canvas so that I wouldn’t have to worry about doing it with the kiddos around. 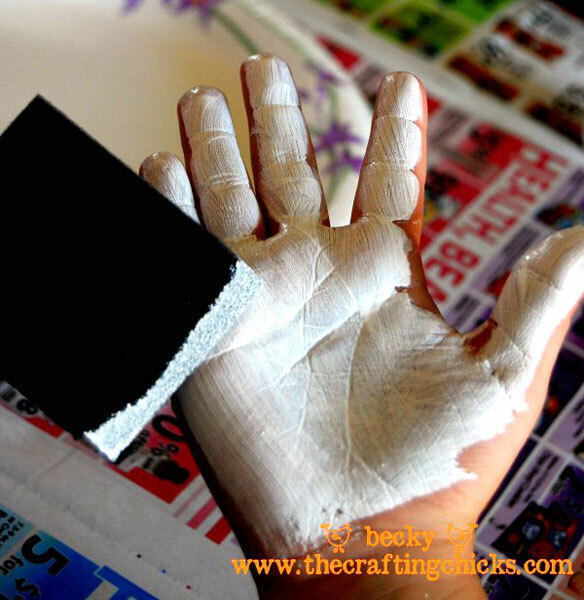 I put some white glossy paint on plate and then painted the kiddos hands and helped them place their hands on the canvas. Then quickly, sprinkled some glitter over the paint. Shake off the excess glitter and then find a place for the ghosts eyes and mouth. On some of the prints, like the one above, there were perfect black spots left open for the mouth. It was so fun to see the different shapes each hand made and how they each turned out. Don’t you think they are so cute? What fun Halloween projects have you made with your kiddos? That is agreat idea!! I think I’ll make a bigger one w all 4 of my kiddos hands and paint Happy Halloween from “us” and hang it on our door! Okay, now that is adorable. So simple, and soooooo CUTE! That is ADORABLE! I’m so doing this with the kids today! Thanks!! 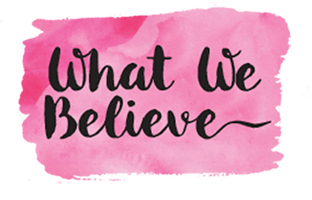 This blog is one of my most favorites! ALWAYS something fun, cute, and amazing. Thanks ladies!! Too cute! I’ll have to make my grand babies prints for my home too. Those are WAY cute! Thanks for sharing them, I’ll be spreading the word. Never thought of doing these on canvas. 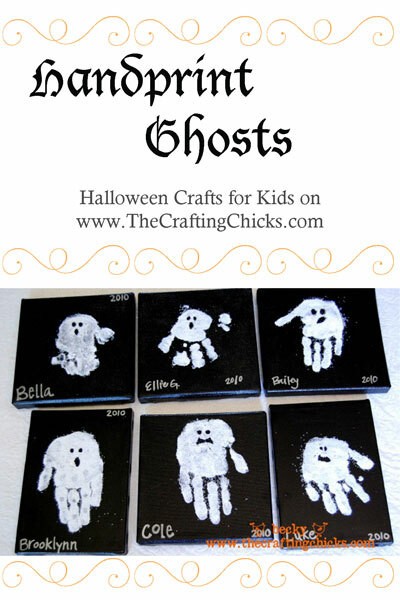 I usually do this same idea with my kids every Halloween, but with their foot print for the ghost shape. May be fun to mix feet and hands if doing a famliy of ghosts. We will be trying this out on canvas for sure! super cute and i totally will have to do this with my kids, so fun! We did this the other day and my daughter loved it! Thanks for the ideas, you guys are quickly becoming a fave! Sorry, I have a silly question. The eyes and mouth – are you painting that on with black paint or are you running away the white? Not a silly question at all. I just used black paint to make the eyes and mouth, but some of the handprints had a perfect spot left open for the mouth so I didn’t touch that up at all. Hope that answers your question. This is just darling and a wonderful keepsake! Now, do you have any ideas for Thanksgiving or Christmas with the children’s hand prints?? Oh Kathy!!! I am actually working on my Thanksgiving hand print idea today!!! Hold tight. It is going to be featured on HowDoesShe on Oct. 31. I will post it on here a couple weeks after that. Just you wait!!! I can not believe my good fortune in finding you!! You are amazing!!! Love it! I made some without the glitter, you gave me an additional ideas Super Thanks! 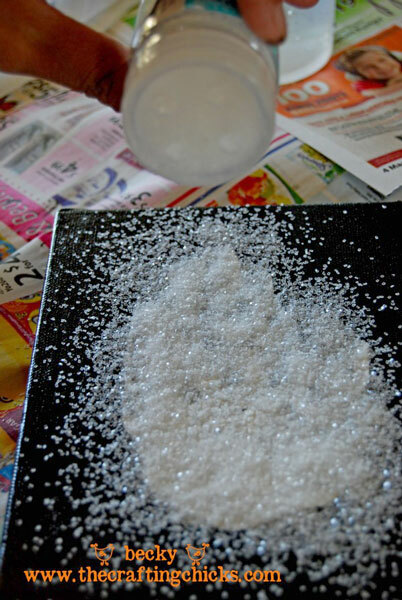 I, too, LOVE handprint crafts!! You should add a “handprint” tag so we can find all your ideas!!! such a nice idea. decoration and souvenir – two in one. i’m linking. i hope you agree. I love the canvas idea! Just another idea… I’ve done these in my classroom for years, but we actually use the bottom of their feet. They turn out totally cute! Sarah, this was darling! Thanks for adding it. I feel that anything that preserves a memory or history is a memory maker!!! I’m writing a round up style post for TLC’s Parentables.com website and would love to share your halloween craft project. What a cute idea! I think we’ll use this idea to make them into cards for the grandparents for Halloween! These are wonderful, I did some with white iridescent paint and the turned out way cool! I have a question, just wondering what you used to write the kids names on the canvas? I have paint pens just wasn’t sure if they would work or not on it and don’t want to mess them up! I just used a silver marker, like a Sharpie. It worked just fine. You’ll have to send pics of your final product! How adorable!!! 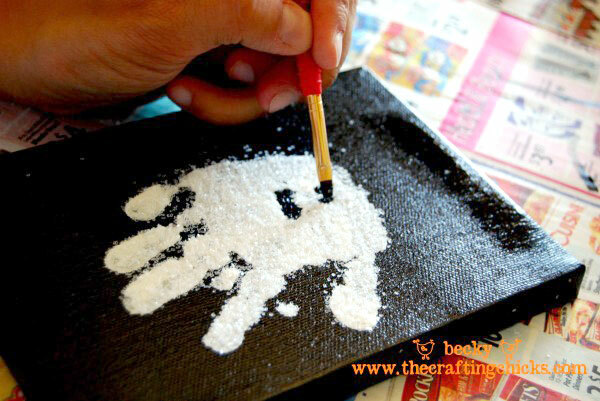 I was looking for the directions for a ghost handprint craft and came across this website. Thank you for step-by-step directions. They came out great for my son’s kindergarten craft project. The kids all had fun making them and the moms all love the keepsake. I was even able to find “glow-in-the-dark” glitter which added a spooky touch. We also had the kids sign their own picture w/the silver sharpie.